Sanitary - Disposable - Time Saving Easy to Use - Instant Positive Reaction Designed with both the user and the patient in mind, these disposable applicators are used for making color transfers from irritated areas under full dentures, partial, etc. Its positive action, plus the dispensing feature and ease of use, saves valuable time. And because it is sanitary, disposable and obviously painless, it is also a pleasant surprise to the patient. To obtain the best results, apply very lightly. 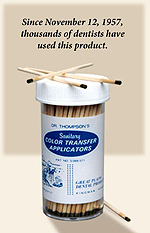 This allows for the positive action with a minimum of smearing.